The Netherlands, or the Low Countries are so called for the fact that much of the land is below sea level and protected by dykes barriering off the North Sea. When I started writing this page I titled it "Holland", but I was soon reliably informed that the country is officially called "The Netherlands" and that Holland refers to only a small part of the country, even though it is known thus coloquially. 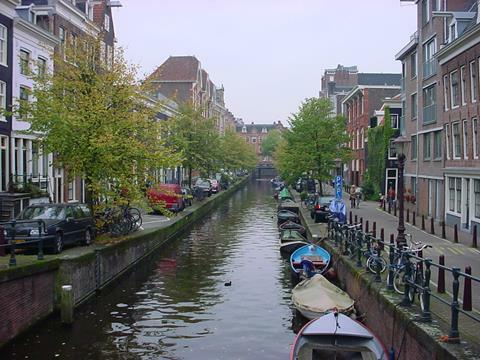 It is also known for windmills, tulips, clogs, canals and liberal politics. I've passed through the Netherlands many times, mostly through Schiphol Airport, but I've only been in the country properly four times, the first trip being in 1990 for a week staying in The Hague. 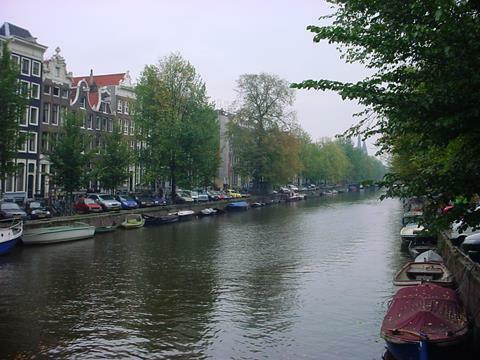 I've been to Amsterdam for three proper visits; 1990, 1998 and 2006, and also to Vlissingen in 2006 on a separate trip. 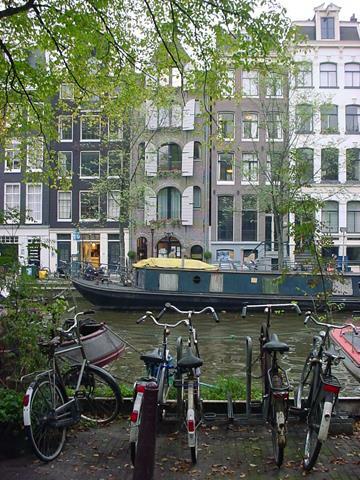 This shot brings together a few typical aspects of the Netherlands, the narrow houses, canal and particularly the bicycles, everyone goes around on one which is a rather good idea given how flat the whole country is. 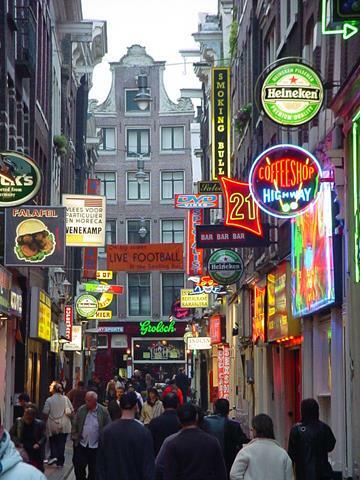 A neon-lined street in the city centre is representative of some of Amsterdam's more gaudy areas, complete with a fag-smoking bloke. 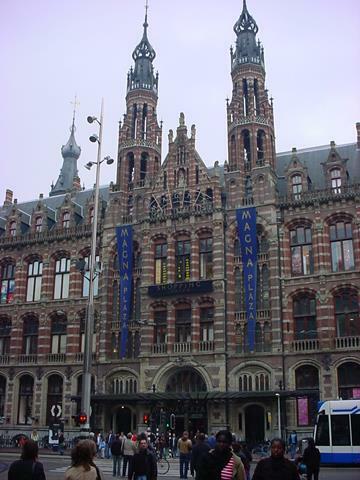 Magna Plaza, just behind Dam Square and the Royal Palace, was giving out free cheese when I was there, what a bonus! 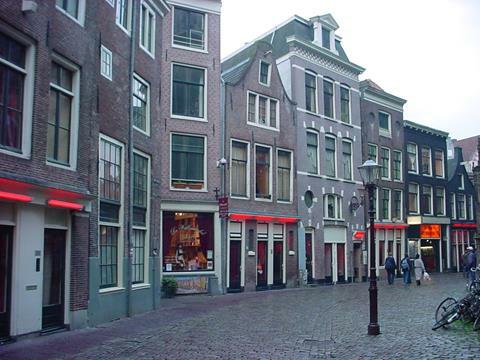 A typical Amsterdam street somewhere in the southern part of the city centre, the buildings often lean slightly in odd directions. 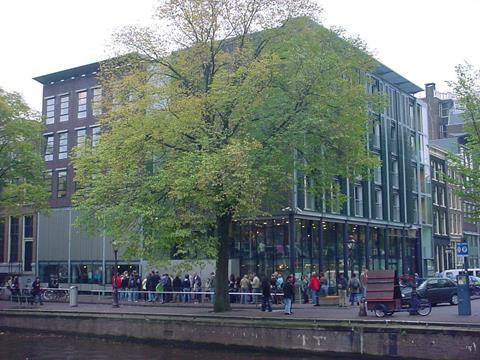 Anne Frank's house is considerably smaller than the modern museum adjoining it, which had a very large queue outside so I gave it a miss, having been there before in 1990. 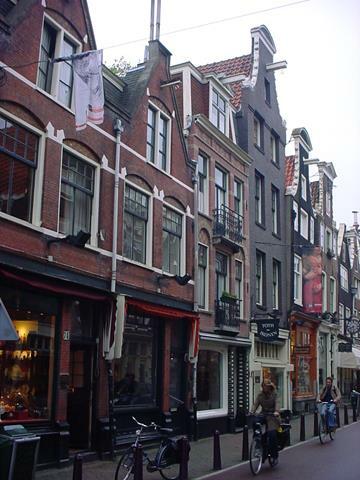 Anne Frank and her family hid in an annexe of the house for a number of years under the noses of the Nazis, who unfortunately found and captured them not long before the end of the war. 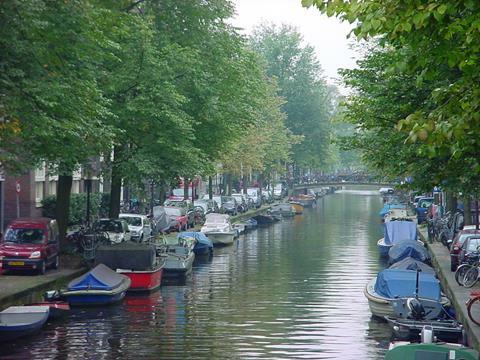 ...and here is a small canal. 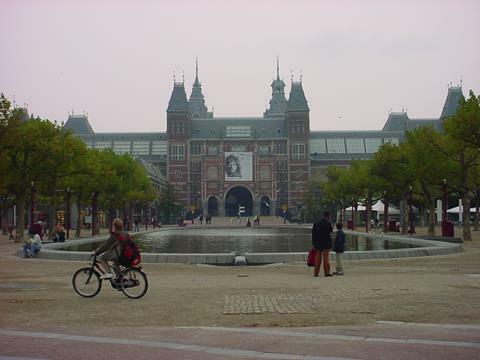 Of the city's many museums, the Rijksmuseum is one of the most popular, the national museum of the Netherlands. Amongst the great works of art are most notably many of those by Rembrandt. Van Gogh however gets his own museum. 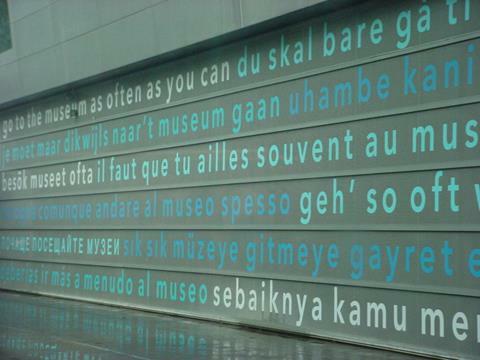 Within the Van Gogh museum, not far from the Rijksmuseum, the only thing I photographed was this interesting wall reminding you to come to the museum as often as you can, in many languages. I particularly liked the Doric "geh' so oft" but unfortunately I didn't spot that when I took the photo so I don't know what the rest of it says! 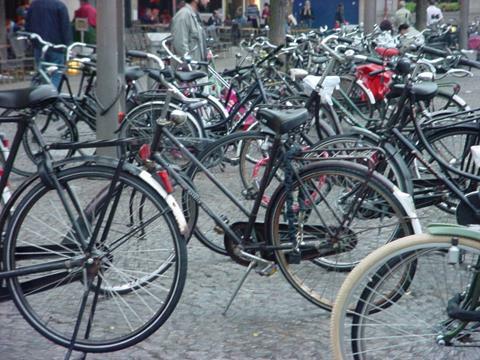 Bikes everywhere in Amsterdam, the whole place is excellently set up for cycling. If only they'd make the same effort in the UK. 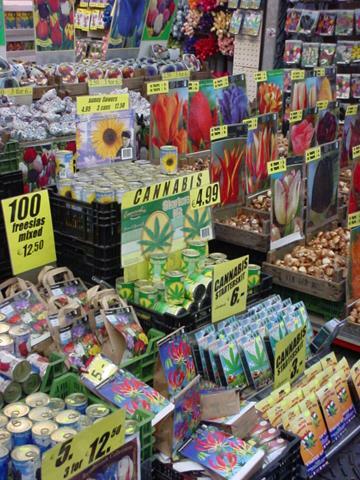 Amsterdam is famous for the tulips and flowers you can buy here, and it is further well known for another type of foliage, also on sale within this market stall. Amsterdam is proud of its red light district, so much so that the city map in the KLM in-flight magazine shows you where it is. Not a place to take your kids though. 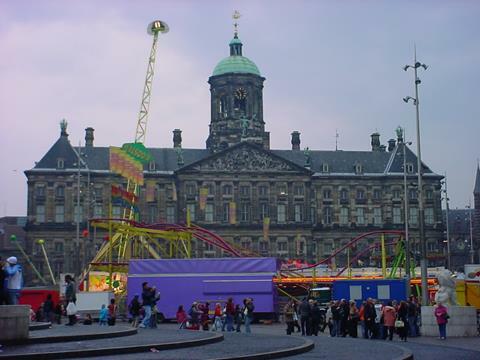 The Royal Palace has stood on Dam Square since the 1600s, but was originally built as the Town Hall, which probably explains why it's not nearly so oppulent as other European Royal Palaces. 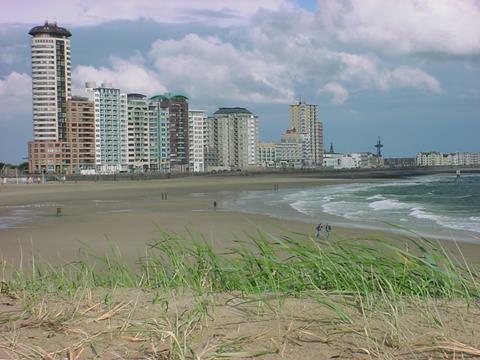 Costa del Vlissingen, right in the south of the country on a wind-swept North Sea inlet near the Belgian border. I imagine it would be quite nice if the sand wasn't blasting a layer of skin off your nose...! 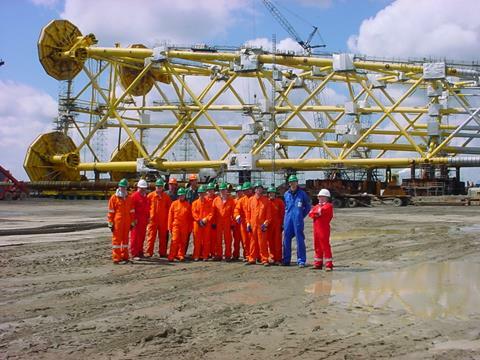 We were in Vlissingen to see the jacket (legs) of a new platform being built, to be placed in the central North Sea. This is the jacket nearing completion at the fabrication yard, it is nearly 160 metres long and weighs approximately six thousand tonnes.